Let’s Celebrate! It’s National Tequila Day! We love any reason to celebrate at Dreams Resorts & Spas and today is one of our absolute favorite holidays: it’s National Tequila Day! Dreams Resorts & Spas provides the ultimate fun-in-the-sun escape for families, couples and singles. Each of our extraordinary destinations feature pristine beaches, an international array of gourmet restaurants, and activities for every age and interest. Best of all, most every amenity is included as part of Unlimited-Luxury®. As a part of Unlimited-Luxury, all guests are able to enjoy their favorite top-shelf spirits, fine wines and ice-cold beer in any of our bars, lounges and restaurants. Sip your favorite cocktail poolside or out on the beach! And yes, that certainly includes tequila! See below for one of our favorite “make at home” margarita recipes courtesy of Food Network (the best way to enjoy tequila in our opinion!) 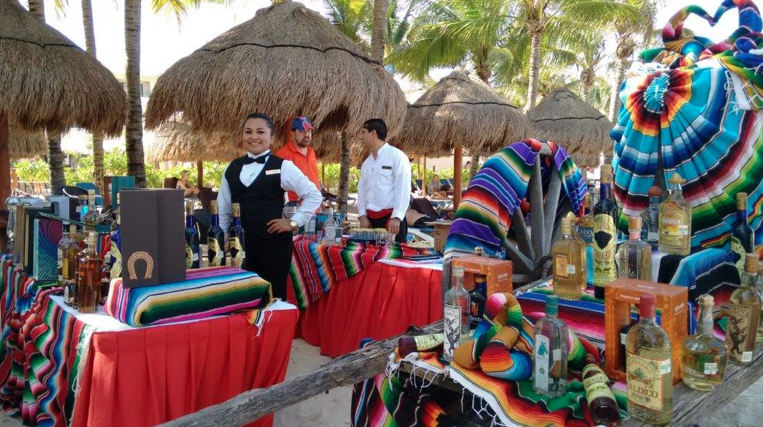 as well as some great photos from tequila-fun at our resorts! 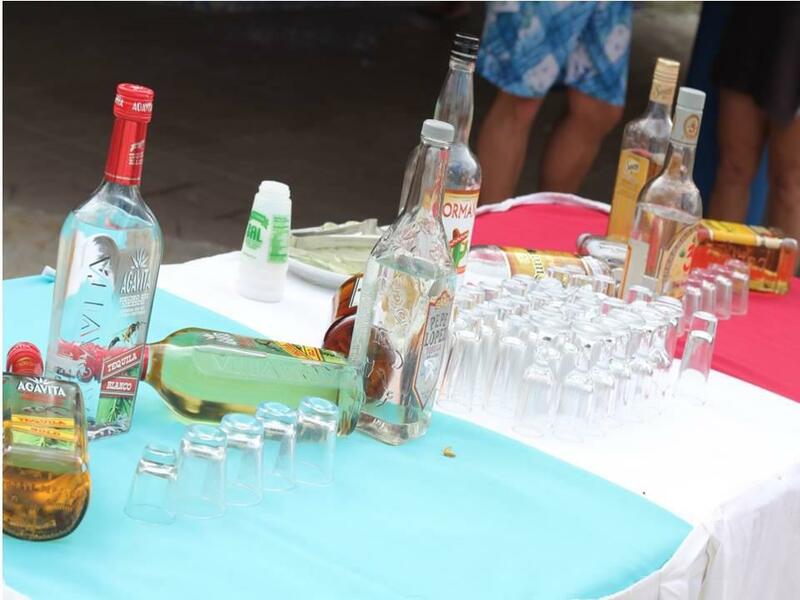 Tequila tasting fun at Dreams Palm Beach Punta Cana! An impressive tequila display at Dreams Punta Cana Resort & Spa! So many choices! 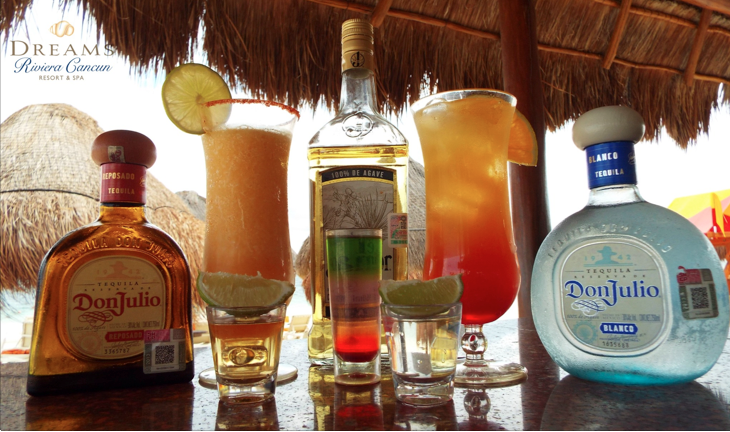 Tequila shots and drinks at Dreams Riviera Cancun Resort & Spa! Now that looks like a great way to celebrate National Tequila Day! So many choices at Dreams Villamagna Nuevo Vallarta! 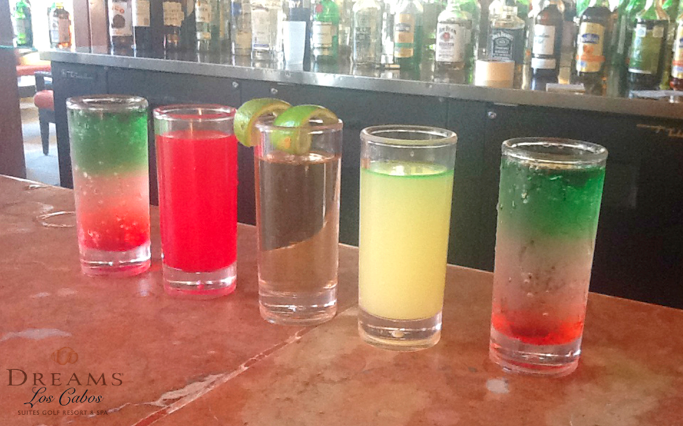 Festive tequila shots at Dreams Los Cabos Suites Golf Resort & Spa! 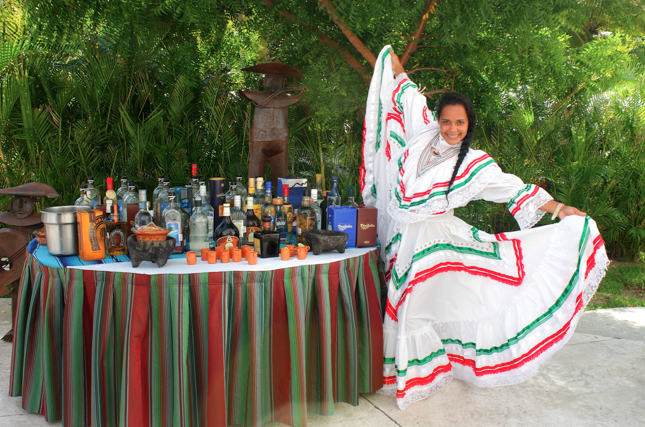 A fun and colorful tequila tasting at Dreams Tulum Resort & Spa! 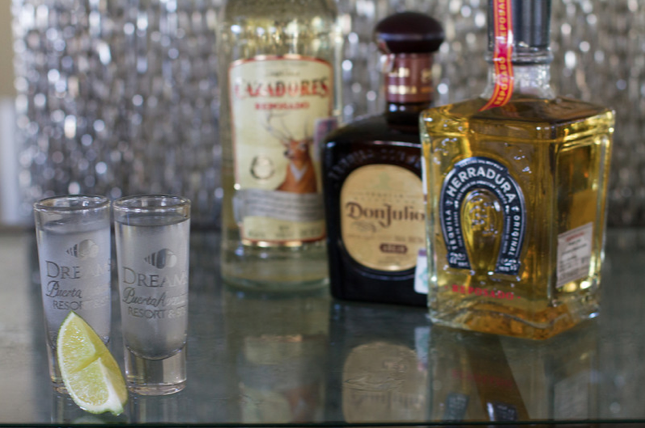 What better way to taste tequila than from Dreams Puerto Aventuras Resort & Spa shot glasses? Fill a cocktail shaker with ice. Add tequila, lime juice, Simple Syrup and orange liqueur. Cover and shake until mixed and chilled, about 30 seconds. (In general, the drink is ready by the time the shaker mists up.) Place Lime-salt-sugar on a plate. Press the rim of a chilled rocks or wine glass into the mixture to rim the edge. Strain margarita into the glass. Put the sugar and water in a small saucepan. Cook over low heat, stirring, until the sugar dissolves. (Alternatively, heat in the microwave.) Store in a sealed container in the refrigerator for up to 1 month. All set? Mix up a margarita and we’ll join you in celebrating this tasty holiday! 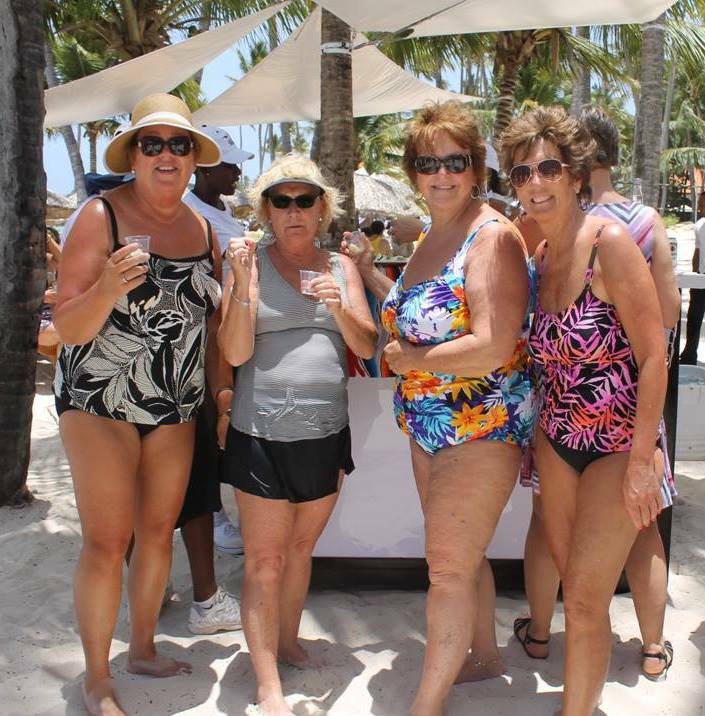 This entry was posted in Dreams Los Cabos, Dreams Palm Beach, Dreams Puerto Aventuras, Dreams Punta Cana, Dreams Resorts & Spas, Dreams Riviera Cancun, Dreams Tulum, Dreams Villamagna and tagged Drink Recipe, Drinks, holidays, Tequila. Bookmark the permalink.